This week’s Throwback Thursday is a classic. 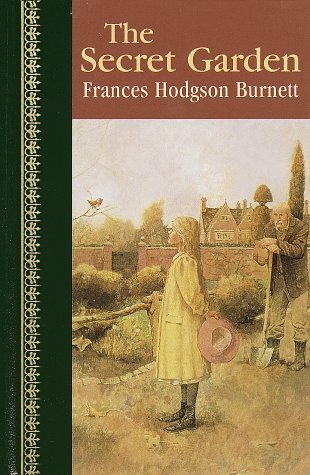 “One of the most delightful and enduring classics of children’s literature, The Secret Garden by Victorian author Frances Hodgson Burnett has remained a firm favorite with children the world over ever since it made its first appearance. Initially published as a serial story in 1910 in The American Magazine, it was brought out in novel form in 1911. The plot centers around Mary Lennox, a young English girl who returns to England from India, having suffered the immense trauma by losing both her parents in a cholera epidemic. However, her memories of her parents are not pleasant, as they were a selfish, neglectful and pleasure-seeking couple. Mary is given to the care of her uncle Archibald Craven, whom she has never met. She travels to his home, Misselthwaite Manor located in the gloomy Yorkshire, a vast change from the sunny and warm climate she was used to. When she arrives, she is a rude, stubborn and given to stormy temper tantrums. However, her nature undergoes a gradual transformation when she learns of the tragedies that have befallen her strict and disciplinarian uncle whom she earlier feared and despised. Once when he’s away from home, Mary discovers a charming walled garden which is always kept locked. The mystery deepens when she hears sounds of sobbing from somewhere within her uncle’s vast mansion. The kindly servants ignore her queries or pretend they haven’t heard, spiking Mary’s curiosity. The Secret Garden appeals to both young and old alike. It has wonderful elements of mystery, spirituality, charming characters and an authentic rendering of childhood emotions and experiences. Commonsense, truth and kindness, compassion and a belief in the essential goodness of human beings lie at the heart of this unforgettable story. It is the best known of Frances Hodgson Burnett’s works, though most of us have definitely heard of, if not read, her other novel Little Lord Fauntleroy. Did I like The Secret Garden when I first read it? No, I didn’t. In my defense, I was around 9 years old when I read it and I thought it was super boring. I reread it in my teens and that’s when I loved it. I have reread it several times since then and still loved the book. Would I read The Secret Garden now? Yes. I have actually read it a few years ago. Target had a copy of it in its $1 bin. So, I picked it up and read it to my son and daughter (who were 4 and 6 at the time). How many stars did I give The Secret Garden when I first read it? Well, if I have to go by 9 years old me, it would have gotten 2 stars…lol. I wasn’t very knowledgeable about books back then. How many stars would I give The Secret Garden now? 5 stars. Have you read The Secret Garden? Love it? Hate it? Meh about it?